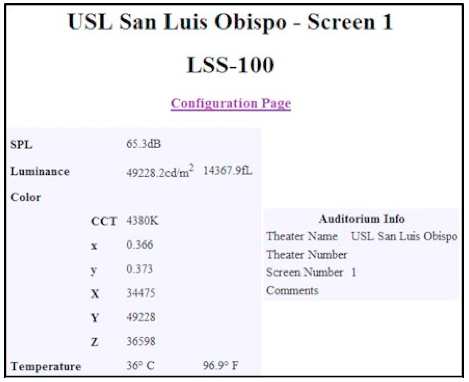 First, the USL LSS-100 Light & Sound Sensor measures sound pressure level, luminance and chromaticity from its mounted position on the back wall of the theater auditorium. The 2 degree spot measurement is transmitted to the user as XYZ and x, y points and CCT, with great precision. The audio section measures C weighted pink noise, giving the level in the room in tenths of a dB. The unit plugs into the cinema facility's IP network so these readings can be taken by anyone with access through the firewall. The unit is small and unobtrusive, with only the power and ethernet cables going through the wall, connecting the system into the booth and then to the IP network. This is how the setup page looks, and following that is a shot of the unit itself and a version of the report it creates. 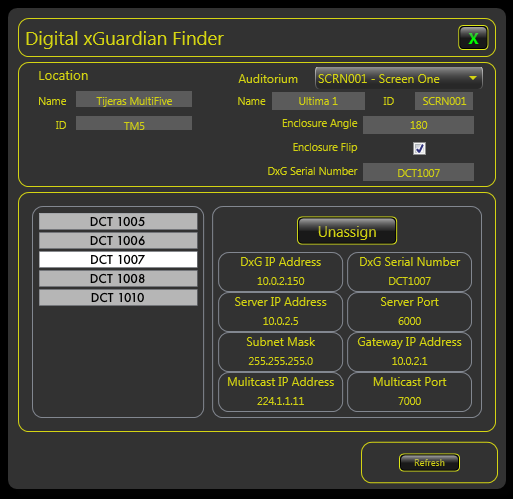 Another network device is the DXG – Digital eXperiance Guardian from Digital Test Tools, LLC. This new company is filled with industry veterans and this will be their first product in this collaboration. The DXG setup is more complex since both its microphone section and its colorimeter remote suspend from the ceiling. 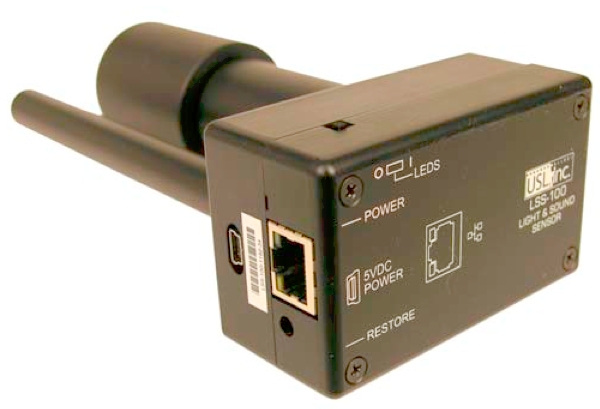 In one sense it is easier, since it uses Power Over Ethernet, which puts power, control and data on one ethernet cable. The design uses 5 microphones to discern levels at many frequencies, as well as phase and the direction of THD problems. Pulsed sounds at various frequencies avoids the buildup problems that pink noise creates. With all this, if a new rattle or hum occurs, a technician can be sent by the NOC to look for something in a particular direction that reacts to a particular frequency, decreasing the time to find whatever got loose or was inserted into or taken from the audio system. Like the USL system, the DXG's value comes from giving the user changes from a baseline measurement. Both systems would be used after a picture and audio room tuning to capture that baseline. Since the DXG captures much more data (levels and THD at different frequecies from individual speakers, and phase information from pairs of speakers at multiple frequencies, for example) the output is put into an xml file and an SQL database so that reports can be generated. These standard tools allow the client to easily integrate the data and reports into their monitoring systems. There is also a parameters list which the customer sets up to monitor "warning" and "critical" points that can trigger notification through Web 2.0 interfaces. And, critically, the system uses 'percentage of variation from the baseline' since it is easier to keep track of trends this way instead of using baseline numbers that might vary from room to room. Knowing that the data point has gone beyond a 5% threshold, for example, is easier to notice than figuring whether the new x,y matrix numbers are within MacAdam's Just Noticable Difference oval. In addition to the "variation from the baseline" concept the DXG colorimeter also includes a pull-down in the auditorium set-up page to mark date and serial number changes of bulbs, both for 2D==>3D changes and for EOL changes. Plus, instead of one 2 degree spot – the SMPTE/ISO spec for calibration – the DXG colorimeter measures a broad section of the screen. The system includes audio and picture DCPs that run through the projection system. The test system and projection system run asynchronously, meaning that there is no connection or feedback to or from the system under test. A playlist is created with automation instructions to shut down the lights, put the masking in the proper position, put the sound processor at the proper level, make a warning annoucement in the room, then play the DCPs in the proper sequence. Since audio contamination from adjoining rooms would throw off the audio tests, care must be taken when setting up the daily or weekly process. The DigitalTestTools literature states that there is plenty of space for growth with the DXG, with options for forensic marking tests and IP network tests coming in the near future, as well as an option to test the signals from the various equipment that broadcasts data and sound to personal closed caption and enhanced listening systems for the deaf, blind, hard of hearing and partially sighted patrons. Following are some screen shots from the Digital eXperiance Guardian. There is a features movie at Digital eXperiance Guardian Movie. Now that over 80% of North American screens have made the digital conversion with the EU and UK not far behind, it is great to see that the industry has matured to deal with this last lingering problem of screens drifting out of spec. Consumers complain about it, exhibitors have paid enormous sums to get equipment that can be impeccably tuned. Now there are two methods to montor the actual room. Finally, it should be pointed out and noticed that your author/editor, Charles 'C J' Flynn of dcinematools.com is also Charles 'C J' Flynn, a founding partner of digitaltesttools.com – he is also a long term admirer of USL and the excellent equipment that they produce. So while this article is somewhat an infomercial, it is written as a scientist and disseminator of valuable information...and presuming that it is just a launching point for further research. C J Flynn has also been a long time advocate of Post-Installation Cinema Compliance, writing and presenting at IBC on the topic as far back as 2006 (after retiring from the labors of setting up cinema servers and training their users since before Star Wars II.